Neurologists have precious little free time these days. If we can earn CME while driving to work, walking the dog, or going out for a run, so much the better. It's perhaps no surprise, then, that audio podcasts, downloaded from the Internet and played on mobile devices such iPods, offer an ideal delivery platform for busy multitaskers. According to a July 2007 Manhattan Research Study, Taking the Pulse® v7.0, almost 100,000 physicians are loyal podcast users today — and nearly all of us are listening to clinical news, specialty updates, and material from journals we already read and trust. In late 2005, when Ted Burns, MD, professor of neurology at the University of Virginia, first heard about podcasts, he was immediately struck by their potential for educational use. He realized that they would be a great way to help neurologists and trainees stay up to date with the literature. “I did some research, convinced my wonderful wife that I needed to buy an iPod for ‘work,’ and started to familiarize myself with the world of podcasting,” Dr. Burns recalled. Since August 2006, he has been the editor-in-chief of a podcast sponsored by the American Association of Neuromuscular and Electrodiagnostic Medicine (AANEM), delivering two 30- to 45-minute podcasts per month related to recent literature in the field. Mayo neuromuscular specialist Brian A. Crum, MD, likes to download the AANEM podcasts to his iPod and listen to them on his drive to and from work or on the plane. He keeps those that he may want to listen to again later, and recommends them to students in the neurology courses he teaches. “They're nice informal reviews that offer the added advantage of interviews directly with the experts,” said Dr. Crum. “Like most physicians, I am pinched for time and this is a nice way to use down time to learn,” he added. Steven M. Croft, MD, a Houston neurologist in solo practice, thought podcasts could help patients and their families learn more about their conditions. After doing a fair amount of research, he began recording podcasts in his office. “My patients find it very useful… I'm amazed by the responses I've received,” he said. The source for material: frequently asked questions and concerns from his patients. Although he creates the podcasts with patients in mind — generally covering those topics that he discusses during office visits — he has discovered that colleagues, as well as people from all over the country, have been tuning in. “It has created a community of caring and communication which is invaluable to me and my practice,” he said. Podcasting only requires a computer, a microphone, and podcasting software. The Vanderbilt clerkship uses Audacity, a free audio recording and management program. Medical students generate the text, review the material for accuracy with a faculty member in the related subspecialty, and record a 30-minute segment. The podcasts are then edited by Dr. Jarquin-Valdivia who sets them to background music, generates an MP3 file, and places them on the Web site. “The challenge is to take students who are used to years of reading and transition them to both reading and listening,” he said. But, it's begun to take off. All of the medical students who have gone through the most recent clerkship have listened to at least one podcast and many have listened to them all. “It's an idea whose time has come,” Dr. Jarquin-Valdivia said. CME vendors seem to agree. It's now possible to go online and find a variety of commercially produced podcasts and earn CME credits. But because the market is fairly new, creators are still experimenting with format and style, and not every product hits the right cord. When University of South Carolina Clinical Professor of Neurology, William Brannon Jr., MD, tried listening to a neurology podcast several weeks ago, he was unimpressed. “There was too much fanfare attached to introductions of speakers,” said the retired National Naval Medical Center Captain, explaining, I was reminded of the PBS broadcast known as “The People's Pharmacy”; the attitude of the hosts was rather supercilious and detracted from the mission. While the search for the right formula continues, there is no question that podcasting is quickly gaining popularity. Dr. Burns was recently appointed by Neurology editor John Noseworthy, MD, to serve as section editor for a weekly 30-minute Neurology podcast. Look for the first Neurology podcast on Sept. 4. 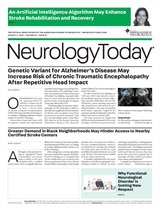 Neurology Today7(17):24, September 4, 2007.